This is an anime adaptation of the classic novel "Treasure Island" written by Scottish novelist Robert Louis Stevenson in 1882. You all probably know the original book from Robert Louis Stevenson "The Treasure island". Well, as this anime is based on the book, you would assume that the story is pretty much the same. You're right, it is, except that in my opinion it's a little bit...more exiting. Those who have read the book know that the pirates didn't find the treasure because Ben Gunn had already dug it out and hidden at another place. It's completely different in the anime. Here, is the secret of the treasure much more puzzling, an amazing quest left by the famous captain Flint. So, the search of the treasure becomes altogether more exiting and has a lot of more adventures in it. Before you question the fact that I have put a 10 here, I remind you to consider that the anime is from the year 1978! To my mind the art is very good, especially when you look at the pirates. Nowadays a bunch of pirates is just a bunc of pirates, but here - look at them - they are drawn with their own characteristics, so each pirate has a look of it's own and stands out from the other pirates. I think it's admirable. And again, I have to remind you that the anime is from the year 1978, so I won't comment nothing more on this behalf. Except, that I find the soundtrack very suiting for the different situations in the anime. Again - individual characters, that is what I found very appealing in the anime. Look at the unimportant pirates - they all have a character of their own, although they aren't the main persons in the anime. And of course the most colorful character - Long John Silver! If you read the book first you'll see that this Silver is more appealing. If you watch the anime first, you'll see only this kind of Silver character in the book later as you read it. In my oppinion the Silver from the anime is much more the friend and father figure that Jim seaks. That's why a third of the anime occurs on the ship (the travel from Bristol to the Treasure island), that is the time when the two characters Silver and Jim become close, so you'll understand their later actions better. Well, as you can see, I personnally think that this is one of the best animes I ever seen. Of course, the difficulty now is to get it. I managed to find and download only the first 7 episodes. Those who understand German, have it a lilltle bit easier - you can find the anime in Youtube dubbed in German. So, I hope this was helpful to you and you'll enjoy the anime as much as I did. 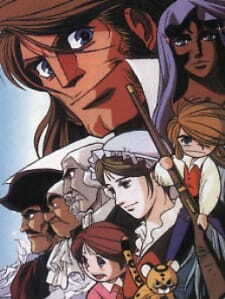 This is Treasure Island, the classic book brought to life in anime. This is one of the best classics i can possibly think of. Staying really close to the story it really brings the story to life for me. The show executes the atmosphere greatly too. The music,background noises and sound effects are well selected and timed to create some of the most dramatic and lighthearted moments i can imagine. The character portrayal of long john silvers is a very lasting impression. It really shows the duality of his character while maintaining his opposing force threw the entire series. Jim is depicted a bit annoyingly tho, a real brat at times but that's part of the charm when you have a unlikely hero. The art is great for its time and aged well i think. In my opinion classic anime art is great and i prefer it more too the overly used CG but that's my opinion. Like most classics it uses a warm and bright color pallet most of the time but it is no stranger to deeper shades of blue,purple and black to showcase darker moods. In summation this is a 10, the story is a great classic novel so you can't really go wrong. The art and sound are done well and really belong in the show. The characters are likable and lasting, Silver is one of my favorite characters in anime of all time. So start watching this and you will be surprised at how much you will love this show. Takarajima is an old gem that I had only recently discovered on MAL when browsing through the measly amount of pirate anime and manga. I had already watched multiple versions of treasure island like long john silver 1954, treasure planet, treasure island 1950 and black sails the events before treasure island. When I had just started the series I was not expecting much, but unlike the other takes on treasure island the characters were more fleshed out. Like Billy Bones, who in this series grew close to Jim Hawkins for the short amount of time, he had spent with him. Billy Bones seemed to remind him of his father who was also a seaman thus giving him more of a reason to set off to treasure island than just the treasure but to fulfill his promise with Billy and follow in his father's footsteps. The best thing about this take on treasure island had to be their take on Long John Silver who was badass, intimidating and charismatic all wrapped into one package. He was so obsessed with the idea of finding the treasure his whole life, but it did not mean that he desired the money it was more likely that he desired the adventure it would take him through. It was a step up from the other adaptations of treasure island and had a better ending than all the rest. For its time the artwork and animation were outstanding and it made great use out of the painted/shaded pictures that highlighted moments in the anime. Sadly for the sound, I could not give a proper rating as I could only find one place to watch it which was on YouTube. The videos were in German and had gaps in the audio along with the awful subtitles that sometimes barely made sense. Loved almost every character in the show, as they all had individual personalities including some minor characters. Apart from problems with there only being a German version that was badly subbed and gaps in the audio it was one of the best anime that I have seen in a while. Highly recommended though hard to find anywhere to actually watch it, unless you just buy the DVDs. It has now become my favourite take on treasure island, well until they make the sequel the black sails.